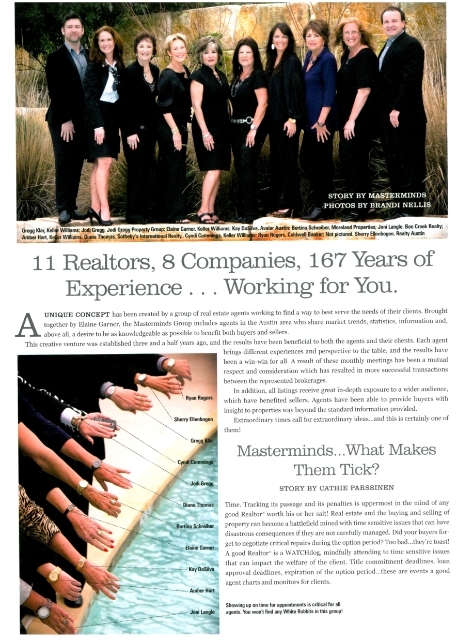 11 Realtors, 8 Companies, 167 Years of Experience . . . Working for You. "A unique concept has been created by a group of real estate agents working to find a way to best serve the needs of their clients. Brought together by Elaine Garner, the Masterminds Group includes agents in the Austin area who share market trends, statistics, information and, above all, a desire to be as knowledgeable as possible to benefit both buyers and sellers. This creative venture was established three and a half years ago, and the results have been beneficial to both the agents and their clients. Each agent brings different experiences and perspective to the table, and the results have been a win-win for all. A result of these monthly meetings has been a mutual respect and consideration which has resulted in more successful transactions between the represented brokerages. 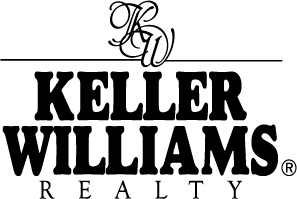 In addition, all listings receive great in-depth exposure to a wider audience, which have benefited sellers. Agents have been able to provide buyers with insight to properties way beyond the standard information provided. Extraordinary times call for extraordinary ideas...and this is certainly one of them! Time. Tracking its passage and its penalties is uppermost in the mind of any good Realtor® is a WATCHdog, mindfully attending to time sensitive issues that can impact the welfare of the client. Title commitment deadlines, loan approval deadlines, expiration of the option period...these are events a good agent charts and monitors for clients."